How are you today hope all is well with good healthy, Darling i have gone through the message which you got from the bank and i am really happy for the care you have for me. Thanks for your ability to help me transfer the money to your position pending my arrival to meet with you,it shows you are a dependable and trustworthy man.Listen,before i gave you this information i saw your profile that you matched mine,i have never told any body about this money the only people that knows about it is you and me no one again knows about it (since my parent' s are dead). So, i will also advise you to please keep it to yourself because i am afraid of loosing the money to people who will disappoint me when the money gets to their care that was why it took me time to tell you about it and i promise you this from my heart (TRUST AND SINCERE) and i equally expect the same from you. Now,regarding the requests the bank needs from us i have with me here the Fund deposit certificate (which i will send to the bank after the preparation of the other two documents) and the death certificate,(which i will also send to the bank) I thought it' s the only thing the bank will need from us but since they need the power of attorney and the affidavit of oath from the high court here in Dakar Senegal. I have informed the Reverend about it and he gave me the contact of this lawyer below,he is a registered lawyer in the United Nations who will help in preparing the documents for us. Please i will like you to contact him through email and phone today,when your contacting him, tell him that you are my Foreign partner and you want him to prepare a power of attorney in your name to enable the transfer of my (Late) father' s account in Standard Chartered Bank Plc, To your account in Your country. So,i will like you to contact him for the preparation of the documents, Please try and contact me when you are in contact with him and let me know if he agrees to help us!. Please i will like you to first of all get the money transferred and from it you can send some money from the account for me to prepare my traveling documents and when you come here we all can move at the same time.I will be waiting for you soonest. A big hug for you,and kisses! Subject: MY FINDINGS FROM THE FEDERAL HIGH COURT. Office address: Villa N° 15 Cheikh Diop Av. Registered Office: Villa N° 15 Av. Cheikh Diop, Dakar - Senegal. 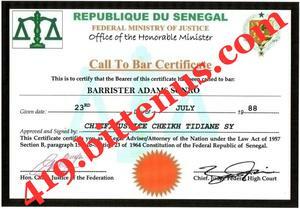 SEQUEL TO YOUR MAIL ON HOW TO PREPARE POWER OF ATTORNEY AND SWORN AFFIDAVIT OR OATH FROM THE HIGH COURT HERE FOR YOU AND YOUR PARTNER, I DISCUSSED WITH ONE OF THE MOST RESPECTABLE REVEREND, MATHEW JOHN HERE IN DAKAR SENEGAL. WE DISCUSSED ABOUT ISSUING YOU AN AUTHORIZATION LETTER AND AFFIDAVIT OF OATH THAT WILL ENABLE YOU TO STAND ON YOUR PARTNER' S BEHALF TO TRANSFER HER MONEY FROM A BANK IN EUROPE TO YOUR ACCOUNT IN YOUR COUNTRY OR ELSEWHERE. PRIOR TO MY INQUIRY FROM THE GIRL AND THE HIGH COURT HERE IN DAKAR SENEGAL, I WAS MADE TO UNDERSTAND THAT THERE ARE FOUR (4) DOCUMENT REQUIRED BY THEM BEFORE THE TRANSFER OF THE MONEY TO YOUR ACCOUNT. (1) A COPY OF DEATH CERTIFICATE OF HER LATE FATHER AND A COPY OF HIS FUND DEPOSIT CERTIFICATE WHICH IS ALREADY WITH YOUR PARTNER HERE. IT ' S NOW REMAINING THE OTHER TWO DOCUMENT, WHICH IS POWER OF ATTORNEY AND THE AFFIDAVIT OF OATH WHICH WILL ENABLE THE BANK DEAL WITH YOU ON BEHALF OF YOUR PARTNER. €80 EURO FOR NOTARY STAMPING AT THE NOTARY OFFICE (Before it will go out from Senegal); MY CONSULTATION & LEGAL MOBILIZATION FEE IS €200 EURO, TOTAL OF (€750 Euro) SEVEN HUNDRED & FIFTY EURO TO GET EVERYTHING DONE. MY OFFICE ADDRESS: VILLA N° 15 AV. CHEIKH ANTA DIOP, PARCELLES ASSAINIES. SEND THE LEGAL FEE THIS MORNING, THEN KEEP ME POSTED WITH THE PAYMENT SCANNED COPY OF THE PAYMENT RECEIPT FOR CONFIRMATION OF PAYMENT AND RECUPERATION OF THE SENT SENT. IF I RECEIVE CASH PAYMENT FROM YOU TODAY, I MAY BE ABLE TO COMPLETELY PREPARE & LEGALIZE THE TRANSFER DOCUMENTS WITHIN 2 BUSINESS DAYS. THE ATTACHED FILES ARE (1.) MY CERTIFICATE OF CALL TO THE INNER BAR; (2.) MY PROFESSIONAL IDENTITY CARD. YOU MAY CHECK THEM FOR CLOSE IDENTIFICATION. LEST I FORGET, AFTER MAKING THE PAYMENT MONEY, SEND THE INFORMATION TO ME FOR PREPARATION OF THE LEGAL DOCUMENTS AND FOR RECUPERATION OF THE PAID AMOUNT. NOTE: THAT THE LEGAL DOCUMENTS SHALL BE DRAFTED AND LEGALIZED & NOTARIZED, USING ENGLISH LANGUAGE - HENCE THE DORMANT ACCOUNT AND HOLDING BANK ARE DOMICILED IN THE UNITED KINGDOM. NOTE AGAIN: PAYMENT OF THE CONSULTATION & MOBILIZATION FEE HAS TO BE UPFRONT - THIS IS IN ORDER TO ENABLE ME PROCURE THE NEEDED COURT AUTHORIZATION & BE ABLE TO PREPARE AND LEGALIZE THE LEGAL DOCUMENTS IN YOUR NAME AS SOON AS POSSIBLE. (1): FULL NAME. . . . . . . . . . . . . . . . . . . . . . . . . . . . . . . . . . . . . . . .
(2): FULL ADDRESS. . . . . . . . . . . . . . . . . . . . . . . . . . . . . . . . . . .
(3): BANK NAME AND A/C INFORMATION. . . . . . . . . . . . . . . . .
(4): COUNTRY OF ORIGIN. . . . . . . . . . . . . . . . . . . . . . . . . . .
(5): OCCUPATION. . . . . . . . . . . . . . . . . . . . . . . . . . . . . .
(6): YOUR PRIVATE TELEPHONE NUMBER. . . . . . . . . . .
(7): AGE. . . . . . . . . . . . . . . . . . . . . . . . . . . . . . . .
THANKING YOU IN ADVANCE FOR YOUR EXCELLENT UNDERSTANDING & ANTICIPATED COOPERATION. Subject: see His Names, office address, City and country name, email addresses, and phone number. see His Names, office address, City and country name, email addresses, and phone number. Name of Lawyer: Barr. 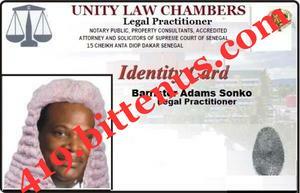 (Dr.) Adams Sonko. Address of lawyer: VILLA N° 15, AV. CHEIKH ANTA DIOP, UNITE 23 - DAKAR CENTRE. City & Country name: DAKAR, REPUBLIC OF SENEGAL. Email contact: bar.adamssonko@lawyer.com ; bar.adamssonko@yahoo.co.uk ; Telephone contact: 00221778824820.
Business, Banking, Maritime, Aviation, Insolvency, Immigration, Bankruptcy & Criminal Lawyer. Phone: (221) 778 824 820. THIS IS OFFICIAL REMIND LETTER TO INFORM YOU THAT I HAVE TAKEN DELIVERY RECEIPT OF YOUR EMAIL AND CONTENTS THEREIN WELL NOTED. MY CONSULTATION & LEGAL MOBILIZATION FEE IS €750 Euro - ITS PAYMENT (URGENT) IS NECESSARY TO ENABLE ME DO THE PAPER WORK. BUT, IF YOU CANNOT PAY THE ENTIRE FEE AT ONCE, YOU CAN STILL PAY DEPOSIT OR ADVANCE FEE BY SENDING ANY AMOUNT OF MONEY YOU ARE ABLE TO AFFORD. WHILE ACQUISITION COSTS FOR THE TRANSFER ORDERS SHALL BE PAID CASH TO THE JUDICIARY HIGH COURT. OFFICE, CITY & COUNTRY ADDRESS: Villa N° 204, Unite-23, Patte D' oire; Dakar, Republic of Senegal.